When Soo Line 2-8-2 No. 1003 left Duluth, Minnesota in August 1997, Goodheart cameras were there to capture one of the most significant moments so far in the steam locomotive revival on the then Wisconsin Central Railroad. A Soo Line steam locomotive was back in steam on "home rails" on the former Soo Line Railroad. 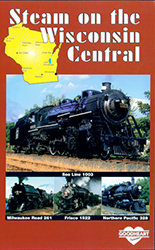 Wisconsin Central, Ltd., formed in 1987 as one of America's new regional start-up railroads, actively embraced the rich tradition of steam railroading by hosting as well Milwaukee Road 4-8-4 No. 261, Northern Pacific 4-6-0 No. 328 and Frisco 4-8-2 No. 1522. Here we bring them all together in a rip-roaring tribute to preserved steam railroading on the Wisconsin Central long before it was acquired by the Canadian National. Soo #1003 is seen on early break-in freight runs and on passenger excursions including crossing the St. Croix River high bridge. NP #328 runs for the Minnesota Transportation Museum and pulls passenger excursions here including several runbys doubleheaded with Soo #1003. Frisco #1522 makes a cameo appearance on the Byron Hill grade south of Fond du Lac, WI. Milwaukee #261 is seen on various passenger excursions circa 1994 with long trains on good smoky runbys with fine stack talk.